The American Offshore Whaling Voyages database has been extensively revised since it’s initial release here in 2018; the current data on the site reflects all changes through 4 April 2019. The revisions include additional voyages, many corrections, and added biographical information about more than a thousand whaling masters and their wives. The whaling data presented in this website were assembled by many individuals under the leadership of Judith N. Lund, Randall R. Reeves, Elizabeth A. Josephson and Tim D. Smith. The work was initiated as part of the Census of Marine Life project (http://www.coml.org/), with financial support from the Alfred P. Sloan Foundation and the Northeast Fisheries Science Center, Woods Hole, MA. This Whaling History website is a collaboration between Mystic Seaport (www.mysticseaport.org) and the New Bedford Whaling Museum (www.whalingmuseum.org). American Offshore Whaling Voyages: A Database, by New Bedford Whaling Museum and Mystic Seaport Museum, Inc. is licensed under a Creative Commons Attribution 4.0 International License. Permissions beyond the scope of this license may be available at https://whalinghistory.org/contact/. American Offshore Whaling Voyages: A Database, https://whalinghistory.org, Mystic Seaport Museum, Inc. and New Bedford Whaling Museum. An earlier version of this database ( Lund, Judith N., Elizabeth A. Josephson, Randall R. Reeves and Tim D. Smith. “American Offshore Whaling Voyages: a database.”) is available at https://nmdl.org. It corresponds to the content of the printed book American Offshore Whaling Voyages: 1667 to 1927, New Bedford Whaling Museum, 2010. Details about all known American offshore whaling voyages are given in this database. Each voyage has been assigned an identifier (Voyage ID) and labelled with the name of the vessel, the departure date and arrival date. Vessels and masters have also been assigned identifying numbers, to distinguish among those with the same name. Voyages have been defined based on customs house records, following Starbuck (1878), with each departure and subsequent return to the port of origin constituting a single voyage. We included all American voyages for which evidence was found (e.g. at least the name of the vessel and/or master, the port and the approximate date of starting and ending). A basic suite of information is included for most voyages, and usually substantial additional information is included on the ship’s capacity and rig, declared destination, and amount of whale products. All voyages that reported whale products have been included. We are aware that some sealing voyages took whales, but we could not track these voyages if they did not declare whale products. Further, for consistency we have included as a separate voyage each departure and arrival, even in the occasional case when, for various reasons, a whaleship returned to its port of departure shortly after sailing, often before any whaling had been attempted. Voyages ended when the vessel returned to its port, or occasionally if it sank or other events intervened. The sources of information about American whaling in the 1800s are extensive, and because of the ample documentation available, we are confident that our database includes nearly all of the voyages made during that century. Prior to the 1800s, however, the records for offshore whaling are less extensive and less detailed, and therefore we have not been able to assemble similarly complete information, especially for years prior to the American War of Independence, from 1776 to 1782. The earliest entry in the database is the sloop Speedwell, a voyage planned for 1667 from the port of Southampton, New York. We have no information on the results of that voyage, nor do we know with certainty whether it took place after the license was granted. Nevertheless, references to this and several other voyages in the late 1600s suggest that there was developing interest in offshore whaling in the American colonies at the time. The information for the second half of the 1600s and first half of the 1700s is patchy and far from complete. Starbuck (1878) lists total numbers of whaling voyages for some years prior to 1760 (e.g. 25 in 1730, 60 in 1748, and 80 in 1756), but we have identified vessel names or masters for fewer than 10% of those. Similarly, from 1761 to 1769, Starbuck indicates that nearly 1,000 voyages sailed, while we have been able to locate information at the individual voyage level for only roughly 25% of that number. In 1770, 125 vessels were whaling from Nantucket, and “Probably fully as many more sailed from all the other ports combined . . (Starbuck, 1878), yet we have identified only 41 of those voyages by reference to the names of their masters and/or the vessels. 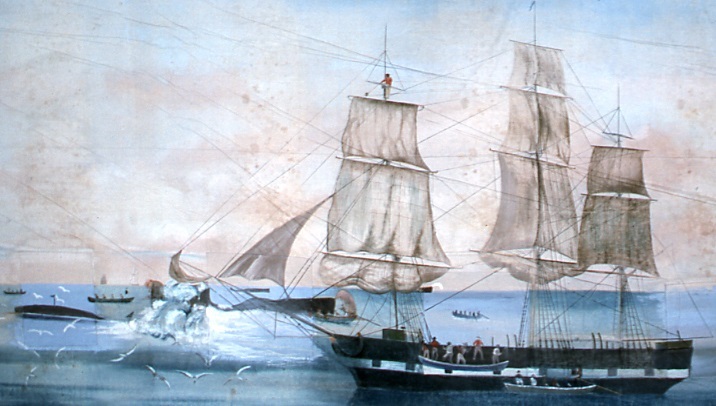 Starbuck suggests that more than 300 vessels were whaling in the years leading up to the War of Independence. Beginning in the mid-1780s, as the fleet began to recover from its depletion during the War of Independence, the characteristics of voyages and their returned cargoes were reported much more consistently. The US Customs Service was established in 1789, and this improved the quality of reporting. 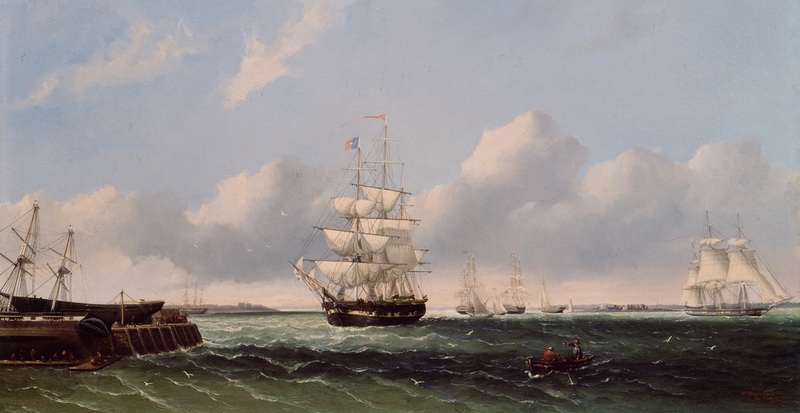 Until the mid-1800s, American whaling vessels were registered almost exclusively in New England ports, and the usual practice was to sail from and back to the port of origin as a single voyage. The products from the voyages usually were returned to the port of origin aboard the vessel. However, as voyages lengthened, some oil and bone (baleen) was shipped home on other whaling vessels or freighters, allowing voyages to continue without interruption. We have tried to track the amounts shipped home in the total product entries in the database using Whalemen’s Shipping List and Merchants’ Transcript (1843 to 1914). After the mid-1800s, some owners of vessels whaling in the Pacific moved their operations to more convenient ports, primarily San Francisco and ports in Hawaii. Voyages by vessels that had changed their registration to Hawaii were not included in our database as Hawaii did not become part of the United States until 1898.